For the New York City fall 2014 collections this week, you're inviting Instagrammers to shoot and share pictures. Couldn't you save $2 million or so by not having a show and just doing a social-media event? I think it's important to do the show because so many people come to see the show up close and live. They want to see how the clothes look on models. Some people like to touch the clothes. If you do a runway show well, I think it's very worthwhile. It took you many years to gain recognition as a designer from the fashion establishment. Is that because you started as a retailer? I think it was the advertising campaign in the very beginning [which equated Hilfiger with Ralph Lauren and Calvin Klein]. It sort of pinned me up against the titans, so they were, I would say, uneasy in accepting me into their world. 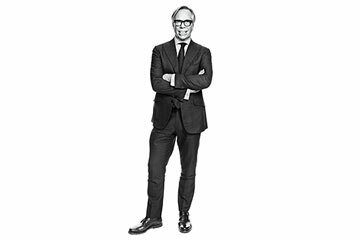 You haven't been chairman of Tommy Hilfiger for 11 years. Do you miss it? It's liberating in that I don't have to be in meetings every single day. But I miss it because I'm sort of a control freak and I would like to be able to make the decisions on every color of every button and on every person we hire. Your foundation has funneled a lot of money into autism research. Why that cause? It has affected my family [two of Hilfiger's five kids are autistic], and I see other families struggling with it, and I know what it's like to have that struggle. There really isn't a cure, because nobody knows the cause. I put my money in brain research because eventually they'll find that it's some sort of missed connection in the brain. After five decades in fashion, have you concluded that there is one reliably on-trend item of clothing? Whatever you buy will go out of style at some point, whether it's the width of a tie, the length of a dress. Everything does come back--it just comes back in a slightly different way. It's really rare that you can reuse it. And is there any trend that should never be revived? When I see people wearing floral prints, I think they really don't have great taste. Why would you want to wear a print you see on a bedspread or wallpaper in an older person's home? Your business has been tied to music trends. Now that musicians have their own lines, has that made it harder for you? It's interesting, because a lot of these brands have not been really successful. Jennifer Lopez is an exception. And Sean John [Sean "Diddy" Combs' line] is successful. But Beyoncé wasn't successful with her clothing. Justin Timberlake was not. Sometimes it doesn't work. You grew up not well off. Your children have had a different upbringing. Do you worry about that? Yes. You do your best. And hopefully it won't negatively affect them. There's also an expectation that they will live up to Dad. That's a difficult thing to have to deal with, regardless of what the parent does. Can the Tommy Hilfiger brand outlast you?